I chose to review the LV-H132 air purifier for two obvious reasons. One of them is it’s sleek design. The other one is the price. At first glance, for an air purifier under $100, this model seems to have everything a homeowner may need and more. The compact design with a soft blue light on top is appealing, especially to those looking for something to suit a contemporary décor. The air purifier is equipped with a 3-stage filtration system and comes with a few smart sensors. Important note: This is a small air purifier and therefore only designed to service rooms up to about 86-87 square feet. 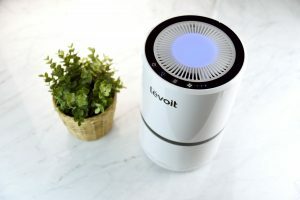 If you’re looking for a Levoit air purifier that can handle a larger space, then take a look at our review of the LV-Pur131. It’s larger brother. Also to note. Having just finished the review of the Levoit – I’ve just realised it’s given me more work to do on the site! 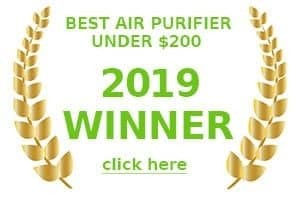 Now – my awards for the best air purifier for smoke under $100 and also my top 3 budget air purifier table need to be updated to include this unit – as it’s simply superb at cleaning the air in your immediate vicinity and comes in well under 100 dollars. It’s coverage size isn’t quite as good as the Fellows aeramax but it does pack in an extra filter. All things you should consider when looking to purchase one. Considering the size of this air purifier, the number of filtration stages is impressive. Fine Preliminary Filter – This filter takes care of all the large particles flying through the air. Even though trueHEPA filter can deal with them as well, large contaminants reduce its lifespan. That is why a pre-filter is a money saver. It takes care of airborne bacteria, large mold spores, pet hair, etc. The pre-filter is NOT washable so don’t try to do it. You can damage the other filters in the process. Replace the pre-filter together with other filters once every 6 to 9 months. TrueHEPA filter – This filter deals with 99.97% of all particles 0.3 microns in diameter. Which means it takes care of all allergens, pollen, and pet dander that all serve to make your life miserable. Air purifiers equipped with trueHEPA filters are a great choice for any environment. This filter needs to be changed about once every 6 to 9 months. Activated Carbon Filter – This filter takes care of the odors. So if you have a smoker in the house, prefer cooking exotic smelling dishes, love large pets or need to deal with any other odor sources, this carbon filter can deal with them in stride. The filter needs to be replaced every 6 to 9 months depending on how heavily you use the unit. Filter replacement: I would say that the inability to wash the pre-filter is somewhat a downside since it leads to a frequent replacement of the filter package. You can purchase a filter replacement package that contains all three filters. It will cost you about $30 but you can find deals and discounts. I haven’t found a place where you can buy these filters separately so I guess you have to go with the package. Filter replacement process is rather straightforward. 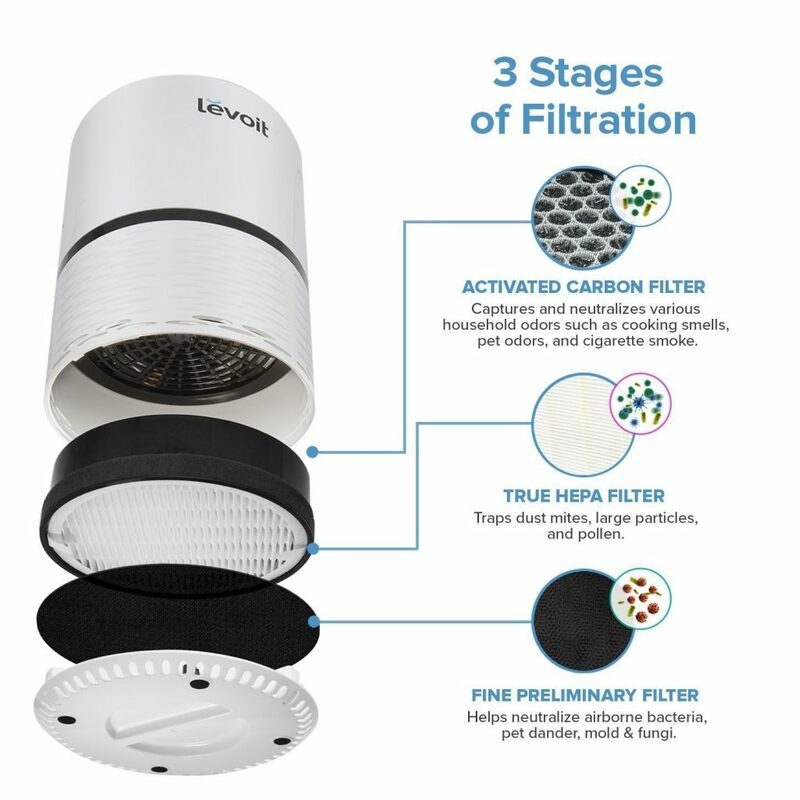 It’s easy to take off the lid, remove and replace all three filters at once. The yearly cost of the air purifier servicing is about $60. The purifier is not equipped with UV lamps or ionizers. However, some people may consider it an advantage since they use these features very rarely. After all, paying extra for something you don’t use is annoying. I’m giving the manufacturer high scores for the design of this air purifier. It has a modern simplistic beauty about it. The unit is very compact (the downside of which is the small coverage area). It’s only 12.6 inches high and 7.5 inches in diameter and weighs just under seven pounds. You can place the unit anywhere you wish as long as it’s at least 15 inches away from any obstacles. You can put it on top of a table or hide it behind the sofa. However, I wouldn’t want to hide such a nicely designed purifier. It looks like a great gadget. Wherever you are planning to use it, be it a small room or an office cubicle, you’ll definitely find a place for it. In fact, the portability of this purifier makes it easy to travel with. People with respiratory problems can take it on trips and use them in hotel rooms. The control panel is conveniently located on top of the unit, making it easy to access and has 5 straightforward buttons. I would like to pay special attention to the blue light. The light shining from the top part of the unit adds the design some extra oomph. Worry not, if you are planning to use the purifier during the night, you can turn the light off. For those of you, who prefer nightlights, or have children who do, this unit can become a two-in-one gadget. The blue light has two brightness settings. I would recommend placing this unit away from the routes you usually walk in the room. It’s so small that it’s easy to trip over. The best place for such a purifier is on an elevated surface. The variety of sensors and features make the air purifier an impressive model as long as they all work as promised. 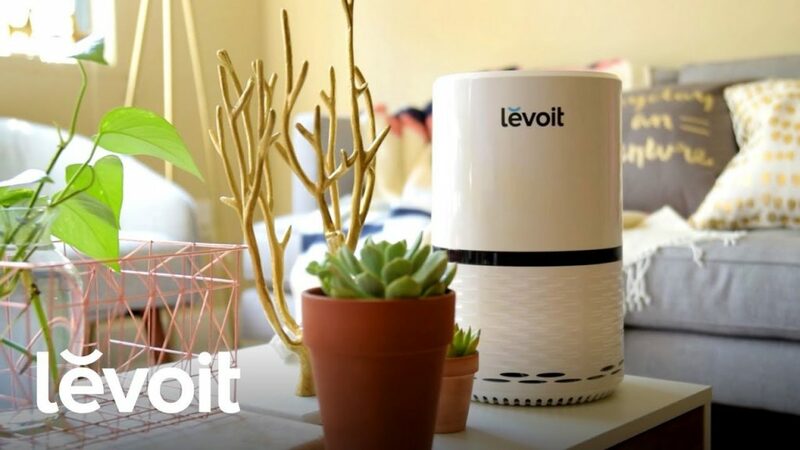 The Levoit is a small air purifier without too many smart options. In fact, the only sensor it offers is the filter replacement indicator. Since you can’t buy the filters separately (perhaps you can, but I just haven’t found such an offer), it’s convenient to know when all three need to be replaced. After changing the filter, you need to press the filter reset button and hold it for 3 seconds. The fan comes with 3 speed settings. By default, the second speed is the optimal option. When you go to sleep, I would recommend switching the fan setting to low in order to reduce the noise. The highest speed setting is great for the initial stages of air cleaning. For example, if you haven’t turned the air purifier on for more than one day, run it on the highest setting for several hours to improve the air quality faster. If you run the unit on a regular basis, the medium setting is sufficient. The controls of this unit are intuitive. The lack of smart sensors is compensated by the simplicity of use. After all, the fewer sensors an air purifier has the fewer chances they have of breaking down. This is one of the smallest air purifiers on the market today so don’t expect it to make a lot of noise. In fact, at the lowest setting, it produces less than 43dB, which is the noise level you usually hear at the library. Medium and high fan settings don’t produce what you would call a loud noise either. When the fan is in the second setting, you can easily go about your business, watching TV or reading. The high-speed setting is quiet enough not to interfere with regular conversations. Overall, this unit is not noisy and can easily be used in a bedroom or office. The coverage area of this air purifier is rather small. This is the price we pay for it being so lightweight and compact. If you have a larger space, you may want to consider buying a couple of these guys. Since the air purifier is well under $100, buying two may turn out to be cheaper than buying one with a larger coverage area. In addition, I would like to note that this air purifier is energy efficient. It uses only about 28 watts, which will save you money on energy bills even if you run the unit 24/7. For such a moderately priced product, this air purifier has an excellent warranty. Levoit offers a 2-year warranty. If you use the unit according to the instructions and change the filters timely, you can take advantage of the warranty. To me, a 2-year warranty means that the manufacturer is reasonably sure that nothing bad will happen to the air purifier for at least two years after the purchase. As a bonus, those, who read the manual (or my review) carefully, can extend the warranty for one more year. All you have to do is visit Levoit website and register the unit. In order to do this, you’ll need an order number (for example Amazon or Houzz). After doing an extensive review of this air purifier, I recommend it to people, who need to keep the air in small spaces clean and want to save some money in the process. This unit is a great choice for small rooms, kitchens, and offices. Even though it has a few smart options, it’s easy to use, comes with a long warranty, and can be carried around with ease. It doubles up as a nightlight too! 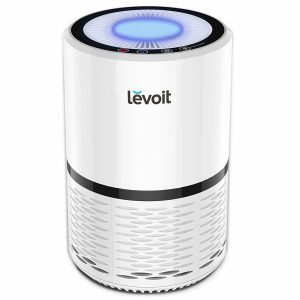 So there we are…The Levoit LV-H132 Air Purifier. Probably one of the best air purifiers under $100 heading into 2018. Whilst it won’t service huge rooms, it’s a handy addition to any desk space and cleaning the air around your immediate area. It gets stellar user reviews on amazon and by most accounts – it’s probably the best budget air cleaner on the market right now.